During this Advent season, we’ve been focusing on spending time together intentionally. 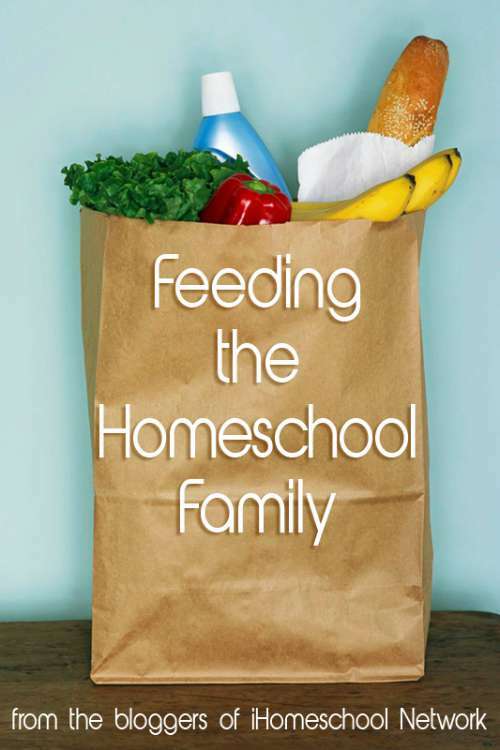 I’ve involved the kids in Meals for New Moms“>meal planning,and we’ve been doing lots of crafts and fun Advent activities. We’ve also spent a lot of time reading. I’ve been inspired by our friend Sarah’s Read Aloud Revival, encouraging families to build their family culture around books. This week, we pulled out a book from Rachel’s curriculum (and a treasured favorite from my childhood) – The Best Christmas Pageant Ever. My kids have been cracking up, listening to tales of the terrible Herdmans. I snuck away and finished the book alone, and surprised myself by crying big ugly tears at the end. Depictions of Mary often make me cry, even when played by Imogene Herdman. 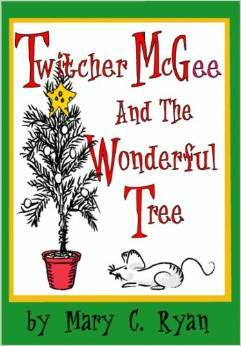 Another selection we’re enjoying is Twitcher McGee and the Wonderful Tree. This story of a sweet mouse who loves Christmas made my kids think about making treats for other people. 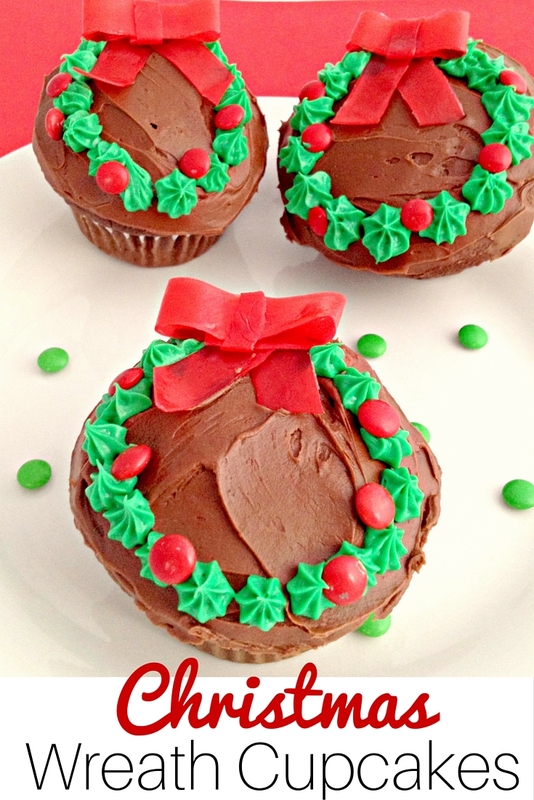 They wanted to make some special Christmas cupcakes to give to our friends and family. I’m all about easy dessert recipes around here. When my kids wanted to make Christmas Wreath Cupcakes, I started thinking about how to make it fun, but easy on my limited kitchen skills. First off, these easy cupcakes are from a box. Grab a box of your favorite Devil’s Food Cake Mix and your apron to get started. Mix up your chocolate cake mix according to directions. While the cupcakes are baking, you’ve got time to make the icing. My kids are spoiled, since I prefer to make my own icing from scratch. If you want to save yourself some work, you could always buy icing in the can, but there’s no way that would fly around here. This icing recipe is easy, and once you’ve had it, you won’t want the yucky stuff from the store. Sift your powdered sugar first, then set aside. Cream your butter well, then slowly add in the almond and vanilla extracts. Add in the powdered sugar in small amounts, mixing well. Then, add in milk, beating until light and fluffy. After the cupcakes cool COMPLETELY, you’re ready to decorate. Whether you made your own icing, or picked some up from the store, you’ll need to divide it up and color it for the wreath greenery. 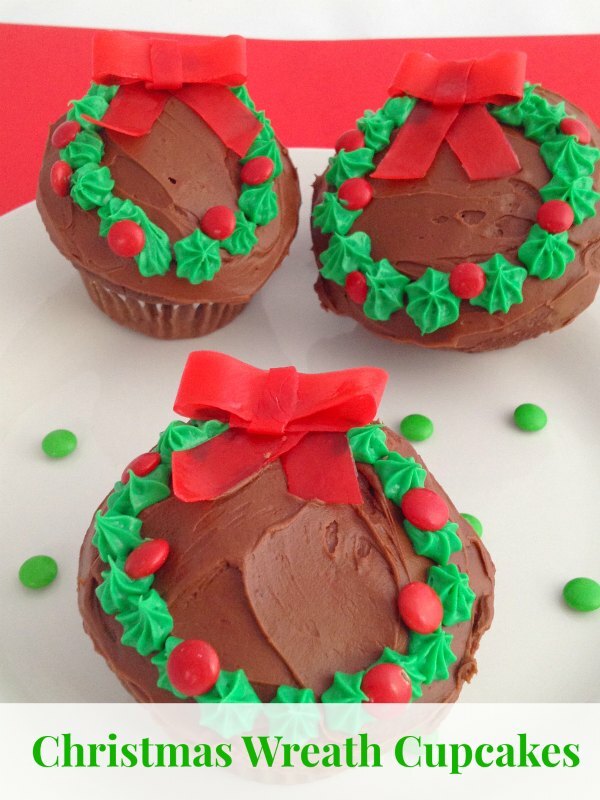 You’ll also need red Mini M&Ms to make holly for your wreaths and Red Fruit by the Foot to create a bow. With a sharp knife or kitchen shears, cut the red Fruit by the Foot and create a small bow. 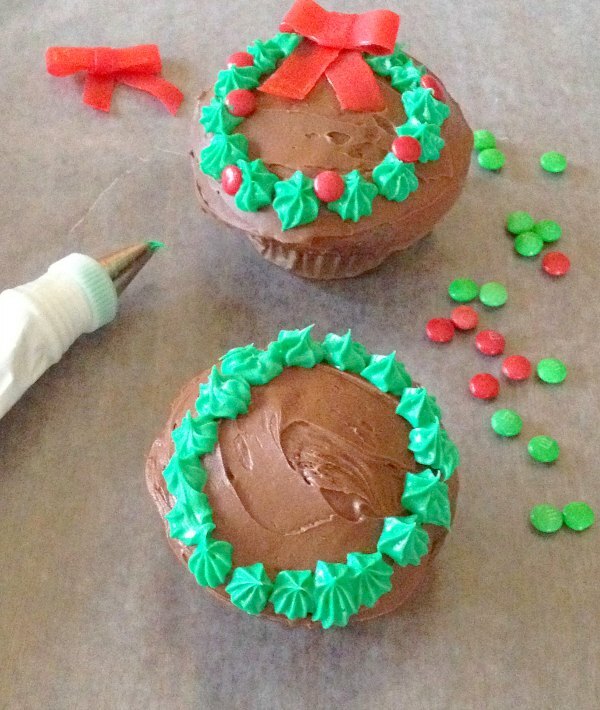 Use mini red M&Ms to add holly to your beautiful cupcake wreaths. Then, pack them up and take them to your next Christmas party or enjoy them with your family! One of my favorites is ‘Twas the Night Before Christmas. This year it’s Waiting For Noel because we too are waiting for a baby to arrive this Christmas season.